Live music has a way of making you instantly jealous, armed with the knowledge that at one point, people were watching what we have to be content to listen to on our headphones or speakers.You never know if you missed that golden concert, the one that you'll be telling your friends in 30 years you went to. While Swedish Mafia is not the most refined group of DJs, they know how to put on a show. The classic BBC essential mix features sets from the best DJs of the world, spinning some of the hottest tracks in house/trance/dubstep, etc. Underlying it all is a running competition, with each DJ/ground trying to one-up their rivals. Each Essential Mix is critiqued by a flock of trance junkies and rave babies, each transition broken down, each drop carefully scrutinized. 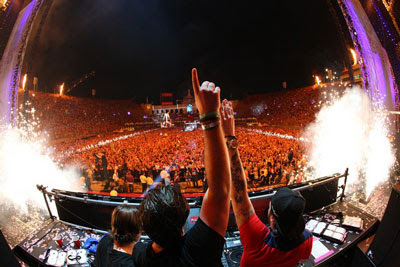 Swedish House Mafia, the motley group of three Swedish DJs, puts on a epic two hour long show for this live Essential Mix from the Creamfields Festival in England. Like mad puppeteers, their control over the masses is undeniable, with the crowd feeding off of the rise and fall of each track. We've featured an article questioning rave culture, but like the SHM say, it is hard to deny goosebumps. The perfect workout/road trip track, put this one on and let it ride.